Fifty-three percent of Americans support such an investigation, while 43 percent opposed. The gender gap is wide: Men divide on the question by 47-49 percent, support-oppose. Women, by contrast, support a congressional probe by 58-37 percent. Rep. Jerrold Nadler, D-N.Y., has promised an investigation into sexual misconduct and perjury allegations against Kavanaugh, which he vehemently denies, if the Democrats take control of the House in the midterm elections. Nadler is in line to lead the House Judiciary Committee should the Democrats prevail. The gender gap is mirrored in views of Kavanaugh’s confirmation and the Senate Judiciary Committee’s handling of the allegations. Men divide about evenly on both, while women disapprove of the confirmation by 58-35 percent and of the committee’s work by 56-38 percent. The poll, produced for ABC by Langer Research Associates, finds that vote impacts in the midterms are possible, albeit slightly so. 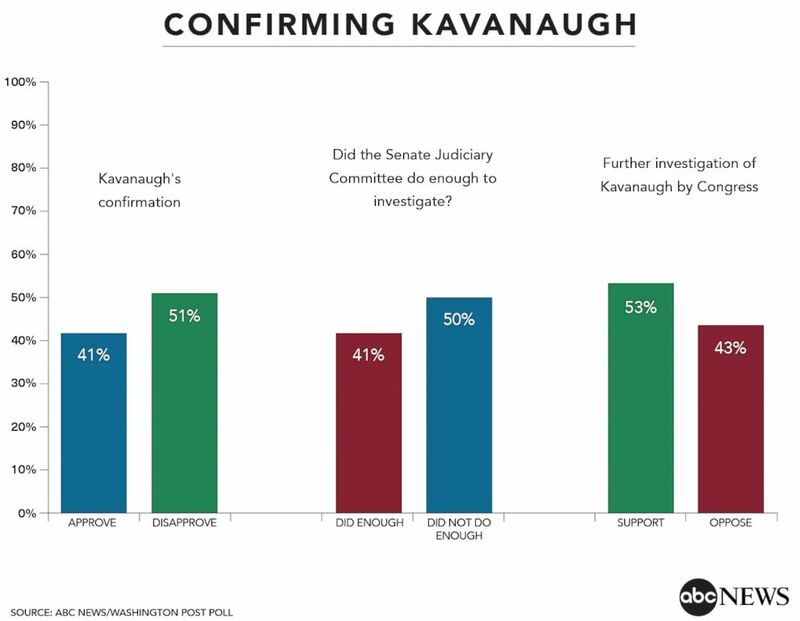 Registered voters say Kavanaugh’s confirmation makes them more apt to support Democratic rather than Republican candidates by a 6-point margin, 33-27 percent, with the rest saying it makes no difference. That said, those more likely to support Democratic candidates generally fit the profile of Democratic voters in the first place, suggesting the confirmation outcome reaffirmed vote preferences rather than altering them. (Erik S Lesser/EPA/Rex/Shutterstock) Demonstrators occupy the East steps of the Capitol ahead of the Senate vote on the confirmation of Supreme Court nominee Judge Brett Kavanaugh, Oct. 6, 2018. The poll also finds a substantial sense that Kavanaugh’s presence will lead to more politically motivated rulings from the court -– 43 percent say so, vs. just 10 percent who expect politics to play a reduced role in Supreme Court decisions. Of course, this view itself reflects political predispositions: Sixty-four percent of Democrats think Kavanaugh’s presence will lead to a more politicized high court; 45 percent of independents agree, dropping to 18 percent of Republicans. 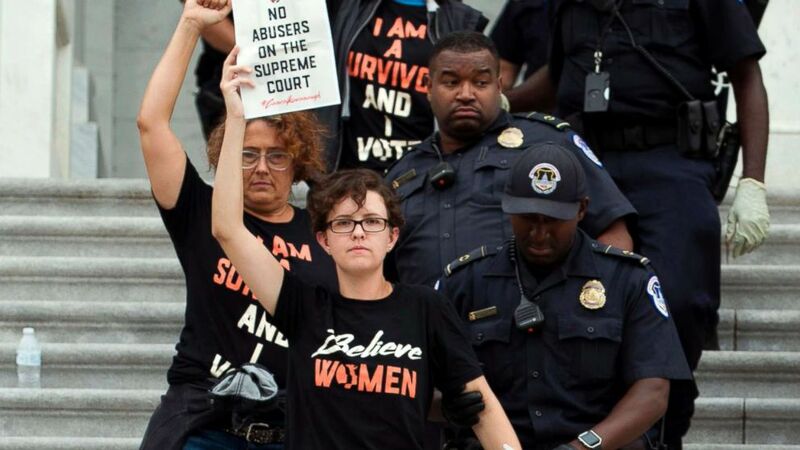 Women not only tilt against Kavanaugh, but do so with more gusto. Forty-nine percent of women strongly disapprove of his confirmation, while just 28 percent strongly approve. Men divide evenly in their strength of sentiment. Gender gaps are broadest in some groups: Women who describe themselves as politically independent are 20 points more apt than independent men to disapprove of Kavanaugh’s confirmation, 61 vs. 41 percent; it’s similar among women age 18-49 compared with their male counterparts, 64 vs. 45 percent. Additionally, moderate women are 17 points more likely than moderate men to disapprove of the confirmation, 69 vs. 52 percent. There are also slight 8- and 9-point gaps between conservative women and men and liberal women and men. 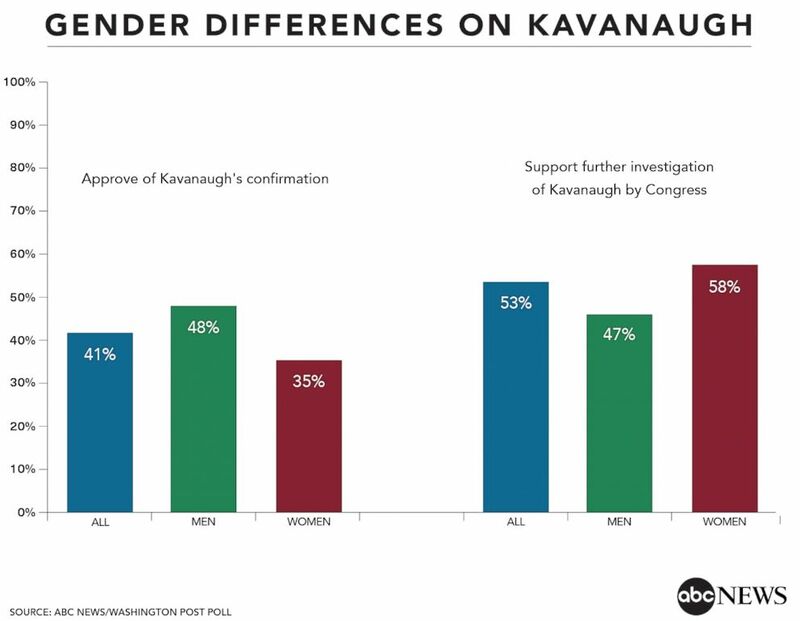 Support for a further congressional investigation, as noted, is 11 points higher among women than men, 58 vs. 47 percent, and women are 16 points more apt to back it strongly, 49 vs. 33 percent. The gender gap peaks among 18- to 49-year-olds -– 70 percent of women in this age group support an investigation, vs. 53 percent of men. That nets to 61 percent support among 18- to 49-year-olds, dropping to 49 percent of Americans age 50-64 and 38 percent of seniors. 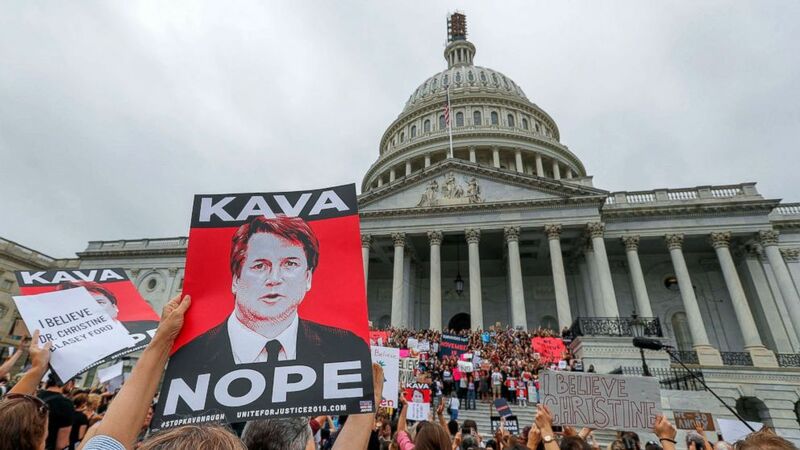 (John Luis Magana/AFP/Getty Images) Demonstrators are arrested on the steps of the Capitol as they protest the appointment of Supreme Court nominee Brett Kavanaugh, Oct. 6, 2018. Attitudes on all these questions include sharp partisan and ideological differences. Notably, though, about a quarter of conservatives, 27 percent, support further investigation by Congress of the newest Supreme Court member. This ABC News/Washington Post poll was conducted by telephone Oct. 8-11, 2018, in English and Spanish, among a random national sample of 1,144 adults, with 65 percent reached on cell phones and 35 percent on landlines. Results have a margin of sampling error of 3.5 points for the full sample, including design effects due to weighting. Partisan divisions are 33-26-35 percent, Democrats-Republicans-independents.